Last August, a visitor to the Summer at the Oratory event recounted the many happy memories he and his friends had spent playing basketball in the gym of SFDS as a child and as a student. As had other buildings on our church campus which served the community for many decades, the gymnasium had fallen into serious disrepair. After consulting with the Archbishop, we were able to obtain funding for the replacement of the roof from an endowment fund which had been set aside prior to the erection of the Oratory in 2005. The work to replace the roof began a few months ago, when Mr. Wally Feld sifted through a good number of bids from roofers to replace the entire roof, comprising of both sloped and flat portions. The actual work began Monday, February 14, with the removal of the old roof, and repairing some of the broken underlying 1x6 planks. The gymnasium is presently used on a regular basis by the KIPP charter school (and occasionally by our home school co-op and the candidates here at the rectory). After the repair of the roof we will be able to continue the restoration of the apartment in the building adjacent to the gymnasium: Canon Lenhardt, first rector of the Oratory, had planned on offering this apartment to a family or an individual interested in living “on campus” at St. Francis de Sales. 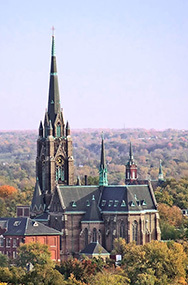 As St. Francis de Sales continues to be a focal point of the community, it seems important and worthwhile to maintain the integrity of the whole campus, so that the church and all its buildings can again serve this neighborhood and all those who congregate here. We are very grateful for the generosity God Almighty shows towards us, visible in the assistance of the Most Reverend Archbishop and of all of you through your prayers and material support. 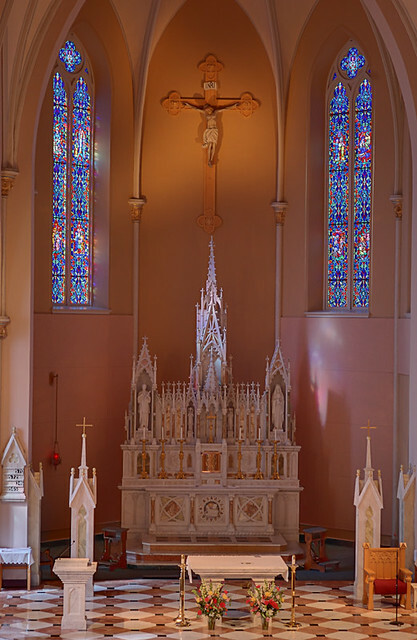 For more information about ongoing restoration work on the campus of St. Francis de Sales Oratory, please consult TraditionForTomorrow and the blog on this site. In what has become an annual tradition for the Institute’s Seminary, the feast of St. Francis de Sales is celebrated with a pilgrimage to Treviso, Italy, where the heart of our holy patron is enshrined in the convent church of the Visitation Sisters. This year, Institute superiors, canons, seminarians and sisters made this pilgrimage, in the honored presence of His Eminence, Raymond Leo Cardinal Burke, Prefect of the Supreme Tribunal of the Apostolic Signatura. His Eminence celebrated a Solemn Pontifical Mass in honor of the Doctor of Divine Charity. The very gracious and hospitable Visitation Sisters assisted from their cloistered choir stalls. 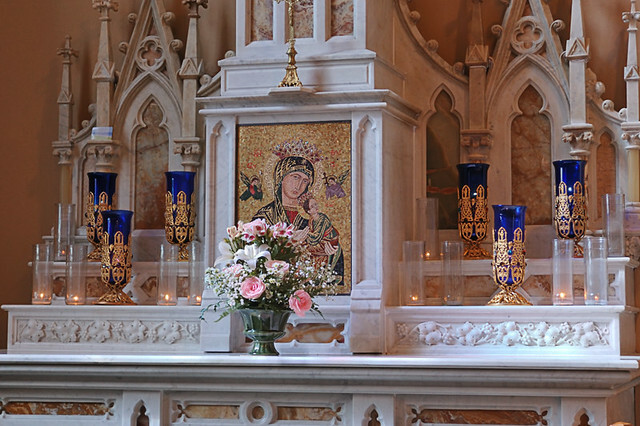 In the late afternoon, Benediction of the Blessed Sacrament was celebrated, after which the holy relic was presented to the clergy, sisters, and faithful for pious veneration. This grace-filled pilgrimage was a very fitting preparation for the following day, when His Eminence, Cardinal Burke, was to ordain three Institute seminarians to the holy diaconate in the seminary chapel of Gricigliano. "God has blessed us today the feast of St. Francis de Sales, on the occasion of this pilgrimage to the very place where the heart of this saint is venerated. For you, my sons of the Institute of Christ the King Sovereign Priest, and my daughters, the Adorers of the Royal Heart of Jesus, this pilgrimage to venerate the heart of St. Francis de Sales is rich in graces for your obedient response to the inspirations of the Holy Ghost in your vocation. 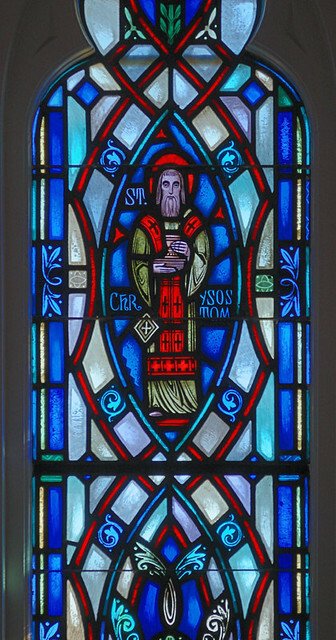 By your veneration of the heart of St. Francis de Sales and your prayers, by his intercession in this place dedicated to his name, you will receive a new inspiration and new strength to serve Christ, Master, Priest and King, in His Mystical Body, the Church. You will receive the grace to imitate St. Francis de Sales in the union of his heart with the Royal Heart of Jesus." In the International Seminary’s Chapel of the Immaculate Conception on Sunday, January 30, Raymond Leo Cardinal Burke, Prefect of the Supreme Tribunal of the Apostolic Signatura, ordained three men to the holy diaconate: two from France and one from Spain. One of the newly-ordained deacons will serve in the Institute’s growing apostolates in Ireland. "Receive the mystery of Faith with a love that is pure and single-hearted. Express in your actions the mystery of your life in Christ. Proclaim the mystery of Faith in all that you say and do, so that all those you meet may be drawn through the Immaculate Heart of Mary to the Sacred Heart of Jesus, the only source of eternal salvation. 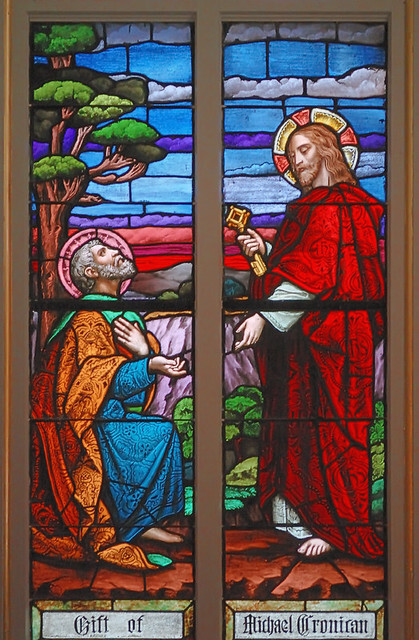 Live every day in anticipation of your meeting with Our Lord on the last day, so that on that day, you may hear the words, “Well done, good and faithful servant; enter into the joy of thy Lord” (Mt. 25:21)." 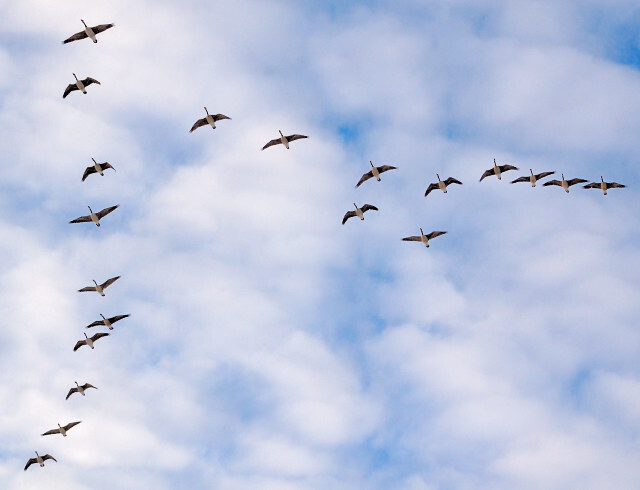 Geese flying overhead, at Willmore Park, in Saint Louis. The controversy is so bad that old friends have become enemies and people are losing their faith over this. Satan laughs. We have to do something about abortion. What Live Action did worked. All three of these have to be taken into account when judging moral culpability: and we must be very much aware that we don't claim to know the ultimate culpability for any particular sinful act when it comes to God's judgement. However, a civil society requires that we must encourage morally right behavior and discourage or punish morally wrong behavior. There is no distinction between personal morality and public ethics, we simply disagree on what what is right and what is wrong; we distinguish the two only because we have a different morality than our social conditioners in the media, education, and government. Many are arguing purely from the objective moral law. Lying is a sin, and the Saints, the Magisterium, moral theologians, sacred Tradition, and sacred Scripture all strongly agree. But neglecting the subjective and relative circumstances is legalism and is unjust. Jesus criticized the Pharisees for legalism. But Martin Luther coined the term ‘antinomian’ to describe those Protestant sects whom he accused of rejecting legalism to the point of recognizing no law at all. True virtue is found between legalism and antinomianism. Others may only consider subjective factors, which is pure hedonism — if it feels good, do it. This can hardly be the foundation for a good society, for only the strong will thrive. More nuanced views will claim that someone ought to put off easy pleasures to gain greater pleasures, but then this brings up the problem of distinguishing greater and lesser desires: could this hierarchy of desire be somehow rooted in human nature, or something higher? Relativism only takes circumstances into account. This is very fashionable because it appears to be tolerant, but again it isn't a basis for a good society because it fails to answer why some actions are better than another. Why not choose any action? If relativism is the only means of judging moral culpability, then why should society judge any action wrong? Were you there? How can you judge? But we know from history that moral relativists judge others extremely harshly, more than those who have the orthodox view of moral culpability. Modern thinking rejects the objective component of moral culpability (usually for reasons of sexuality or greed), and tries to devise ethical systems based solely on subjective and relative factors. Situational Ethics, devised in the 1960s by the Episcopalian priest Joseph Fletcher (R.I.P. ), ignored all moral law except supposedly agape love. Fletcher's system justified abortion, euthanasia, sterilization, eugenics, genetic engineering, and infanticide. Fletcher later became an atheist. I dropped in on a patient at the hospital who explained that he only had a set time to live. The doctors could give him some pills (that would cost $40 every three days) that would keep him alive for the next three years, but if he didn't take the pills, he’d be dead within six months. Now he was insured for $100,000, double indemnity and that was all the insurance he had. But if he took the pills and lived past next October when the insurance was up for renewal, they were bound to refuse the renewal, and his insurance would be canceled. So he told me that he was thinking that if he didn't take the pills, then his family would get left with some security, and asked my advice on the situation. We ought to be aware that the situation proposed is designed to force you to chose euthanasia. It is a simple extension from this conclusion to euthanasia as public policy. In fact, our options are not limited, nor can we predict the future with great accuracy, and situationism ignores or trivializes grace. Another problem with antinomians is that they apply this morality only to themselves; everyone else will be forced to follow their laws without choice or conscientious objection — which is pure legalism. 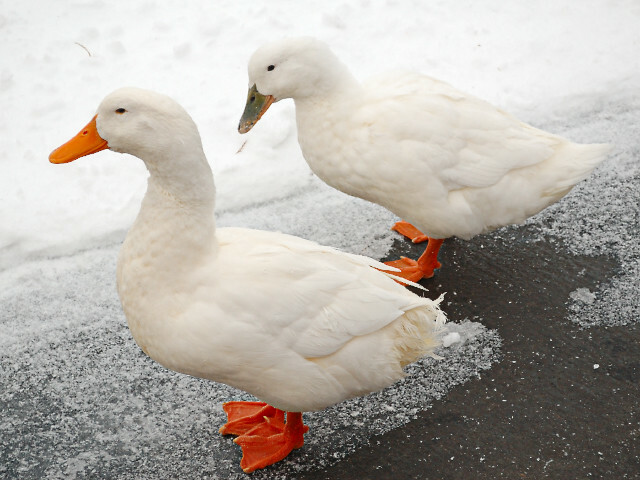 Please remember that evils are found in opposite pairs. Former President George W. Bush and President Barack Obama have been kidnapped and are tied to the tracks in a railroad switching yard. A train is heading towards them. You can throw a switch one of two ways, so that only one of either President Bush or President Obama is run over, while saving the other; if you do nothing, both of them will be run over by the train. What do you do? Undoubtably many people would love to throw the switch one way or the other — or chose to do nothing. But my advice is to not play the game at all — for this game is designed purely to reveal your partisan bias. If you do reveal a choice, please be very aware of what you are publicly advocating. The intention of situational ethics is to make you to chose evil. 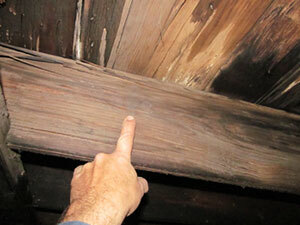 It is World War II and you are hiding Jews in your attic. The Gestapo knocks on your door and asks you if any Jews are in your home. If the Gestapo finds them, they will be certainly murdered. But lying is a sin, so you cannot lie to the Gestapo; moral theology says you cannot sin to prevent sin. So in defense of the truth, do you honestly reply to the Gestapo, even though your Jews will be murdered? This is a classic situational ethics dilemma, and from this dilemma come charges of Pharisaism, legalism, and even disbelief — some refuse to believe in a God that would prefer a person not to lie than to save innocent lives. Controversialists are jumping through hoops attempting to nuance what is a lie and what is not, while others are saying that it doesn't matter at all — the ends justify the means. But it isn't World War II. There is no Gestapo. Although the Jews will remain a target of destruction by Satan and his minions until the end of the age, this scenario will never happen in precisely this way. We can discuss moral culpability from the comfort of our homes or offices, but can we predict with certainty what we would do under extreme circumstances? Who has the right to determine morality from an artificial situation like this? If you believe that the ends justify the means, why is it that some ends are preferable over some means? Doesn't this require an objective factor in moral culpability? Aren't the means ends in themselves? The answer to this controversy is to understand what the objective moral law is about. Lying is a sin, one of many sins. 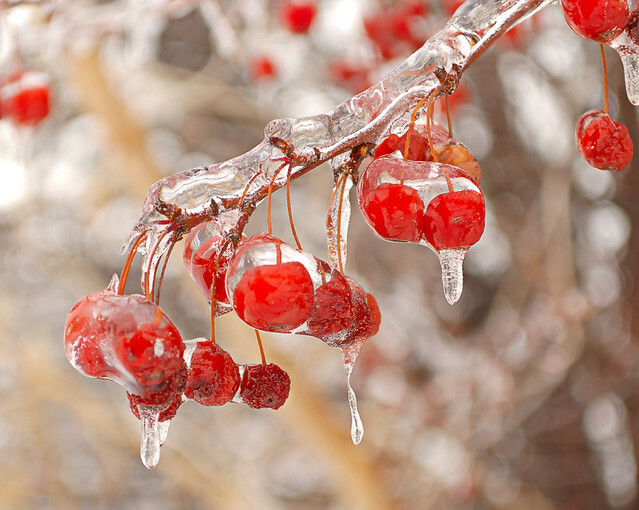 It is a person's responsibility to avoid sin every day, even in ordinary situations. Do you habitually lie to your family, friends, superiors, subordinates, or to the strangers you meet every day? Or do you make truthfulness a part of yourself? Do you lie when you can get away with it, and are truthful if you will be found out? Do you lie in trivial situations, while you pretend that you will be truthful in important situations? Are you plainspoken, or are you always trying to find nuanced ways to tell untruth so that you don't feel guilt about it? Or do you hold to a philosophy that there is no truth so that you can lie with impunity? Constant daily practice of upholding the truth makes you a more truthful person. Daily practice of the virtues will make you a more virtuous person. Forget about hypothetical situations. Be truthful and moral NOW (yes, I am preaching to myself here). If a modern-day Gestapo comes knocking on your door, then, and only then will you know what to do, with God's grace. "Where Have All the Good (Wo)Men Gone?" SEE THE ARTICLE Where Have All the Good (Wo)Men Gone? by Jennifer Fulwiler, which quotes the article Where Have The Good Men Gone? by Kay S. Hymowitz. Social Justice is not just a catchphrase for those who want to pursue liberal issues. It in fact derives from Catholic teaching greatly developed in the 19th and is de fide. The situation described in the articles above is very much a social justice issue. Unfortunately, the division between the sexes is presented as class conflict of the marxist kind: instead of partners, men and women are seen as competitors. At Saint Joseph Church, in Louisiana, Missouri. 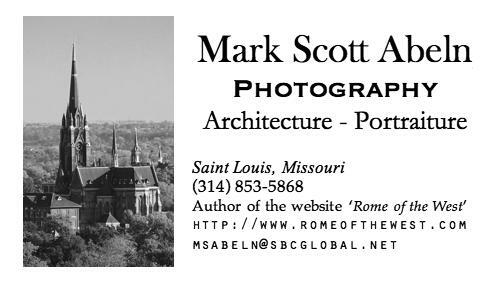 LAST FRIDAY, I made a brief visit to Saint Mary's (Immaculate Conception) Church, in Alton, Illinois. This church was renovated since my last visit four years ago, and on this day, workmen were busy refinishing the wooden doors. Rose window in the choir loft. 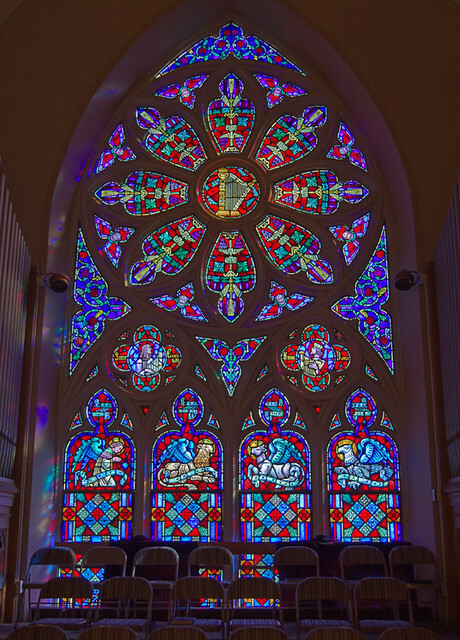 The window depicts a psaltry, Saint Cecilia, King David the psalmist, angels, and symbols of the Evangelists. 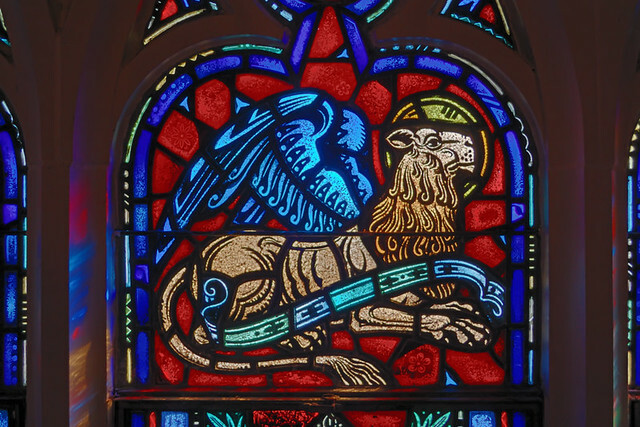 A winged-lion, symbol of Saint Mark the Evangelist. Mary Queen of Peace Mission, located in the Mississippi River town of Clarksville, Missouri. 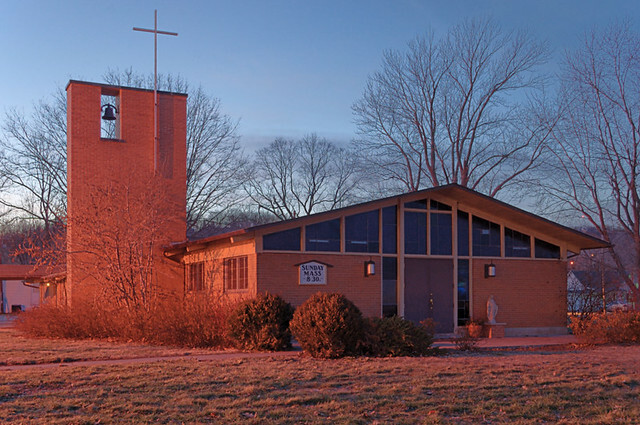 The mission was founded in 1951 and is part of the Diocese of Jefferson City. The church is in Pike County, about 74 highway miles northwest of downtown Saint Louis. RT. REV. JAMES A. GRIFFIN D.D. This is illustrated by a unique depiction of the Sacred Heart. 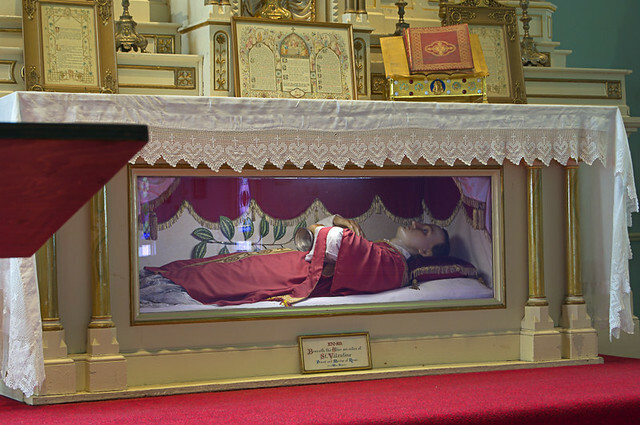 Effigy and relics of Saint Valentine; at Old Saint Ferdinand Shrine, in Florissant, Missouri. The shrine was the home of Saint Rose Philippine Duchesne. Valentine was martyred in A.D. 270, in Rome on the Flammian way. Red is the symbolic color of both love and of the martyrs, for it is the color of blood; and there is no greater love than to give one's own life for the sake of a beloved. As most of you know, from December 2010 to January 2011 we conducted a survey of all Oratory attendees. The purpose of the survey was to obtain concrete figures on our demographics and to learn what attendees’ value most at Oratory as well as what we can be doing to serve you better. The results are very encouraging and, in some cases, pleasantly surprising. Thanks to the generous participation of 200 families and the professional expertise of two dedicated Oratory members, St. Francis de Sales Oratory in South St. Louis is pleased to present the results of our first member survey. Throughout the world, altar servers in the apostolates of the Institute of Christ the King Sovereign Priest are now wearing distinctive cassocks which reflect their service to the altar of God according to the spirituality of the Institute. Thanks to the generous help and friendship of our local tailor, Mr. Linden Blaylock, along with two of our faithful, Mrs. Peggy Meinberg and Mrs. Gretchen Clinton, these cassocks will soon be a part of the liturgical life here at St. Francis de Sales Oratory. The Salesian blue and accompanying cross represent the choir habit worn by our holy patron and his devotion to Our Lady of the Immaculate Conception. Interestingly, it will not be the first time our church sanctuary has seen this style of cassock. Photographs of the early days in St. Francis de Sales Church reveal that altar boys at the turn of the century wore cassocks almost identical to the ones we are in the process of producing now. Servers at St. Francis de Sales in the past, and the Institute in Lisieux. Additional help on this project is urgently needed. If you have sewing skills which could be put to good use, please call Canon Wiener at 314-771-3100. Thank you very much. It seems the Tuscan hills were not spared the latest torrents of white from above, and the seminarians of Gricigliano responded with lightening reflex! Priests of the Institute can only view these photos with a nostalgic gaze as they recall their joyful seminary days and these manifestations of the spirit of our community. These are your priests of tomorrow! With your prayers and support, they will leave the seminary with all the theological and spiritual formation necessary for the service of souls in the apostolate – but they will lose nothing of the taste for battle which they acquired on the fields of Gricigliano! Also, this weekend the Oratory is hosting a play put on by the high school co-op. Details here. NO, Catholics cannot go to confession via an Apple iPhone. No, the Catholic Church is not selling an iPhone app to be used for confession. No, this app does not replace confession. No, you cannot confess long distance. No, you cannot confess using your computer. No, the Vatican does not endorse this app. No, the Vatican does not condemn this app. Yes, the app has the imprimatur of one U.S. Bishop acting under his personal authority. Yes, this app does guide you through an examination of conscience. Yes, the app is flawed but the developer is updating it. Fr. Z reports on this here, here, here, and here. Jeff Geerling comments on it here. You can get the app here for $1.99. Actually, you can confess your sins to anyone: your spouse, a stranger on a bus, your bartender, or even directly to God (although He already knows all of your sins, past, present, and future). You can only get absolution through a priest however, after confessing to him. It is funny how the world hates the idea of Confession — implying all sorts of sinister motives to it, while simultaneously endorsing psychological analysis. Unlike the priest in the confessional, the psychologist knows who you are, where you live, and requires names, places, and details that must never be revealed in the box. And a psychologist almost always charges you for the service, while a priest must never charge you. Nowadays, a lot of people are being forced to go to psychoanalysis. On the contrary, you can go to confession and confess whatever you want, or if you aren't a sinner, then you don't have to go at all; you can do the penance (often just saying one Our Father) or you don't; no one is forcing you to do anything. [Yes, I'm cynical here]. Sigmund Freud, the founder of psychoanalysis, noted that Catholics who frequented the sacrament of confession had no need to see him. Guaranteed absolute secrecy used to be a distinctive feature of the sacrament of confession, but this was called into question several decades ago, and many now consider it unimportant. [A correspondent tells me that during a recent first confession at her church, the girls invariable confessed face-to-face, while the boys invariably confessed behind the screen. I'm not quite sure what to make of this.] I think practical secrecy is utterly important, and certain old customs, such as never confessing to a superior, confessing behind a screen, confessing at a church that has long confessional lines, and taking advantage of confession during a pilgrimage or during a parish mission is prudential, although obviously not essential. The secrecy inherent in the traditional confessional is good for penitents — it does lessen anxiety — it is also good for priests and may lessen the risk of false accusations. Here in Saint Louis, the sacrament is available widely. My old reliable phone finally broke after many years of good service, and I got a new one, a free upgrade. Now many manufacturers attempt to copy the market leader (in this case, the Apple iPhone), but being short of funding, talent, intelligence, or common sense, this is often a failure. 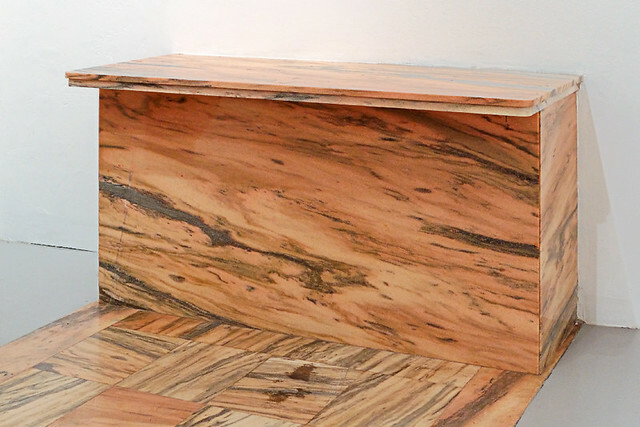 Some features are really hard to get right, and so a competent simplicity is no vice. Incompetent complexity is a vice. The touch screen display, for example, works, sort of, when I want it to (its actions are rather coarse and imprecise), but it also works far too well when I don't. I take my phone with me wherever I go, and keep it in my pocket where it belongs. I got my first hint that something was wrong when my father called me several times — saying he was returning my call. I didn't call! At least I didn't remember calling — or did I? My memory must be failing on me. This problem continued for several days. One day, the telephone dialed up four different people, some of whom I haven't talked to in years (I really do need to prune my phone's address book). I mentioned this problem to a friend, who suggested that it probably has lock screen feature. It does! I programmed the phone to not dial until I type in a short code. Problem solved. However, what good is a cell phone if you can't use it in an emergency? That is the main reason why I have one — I've got the basic voice plan with no data services. Thinking of this eventuality, the phone maker thoughtfully allows anyone to dial the emergency number — 911 in the USA — even if the phone is locked. So instead of randomly dialing friends or family members, the phone randomly calls the government emergency response number! That is so not good. As the 911 operators can determine my location precisely through the cell phone, I imagined firemen smashing through my front door, or the highway patrol chasing my car. I quickly turned off that feature. I sort-of solved the problem by leaving a fairly innocuous menu item on the screen before I turn it off and put it in my pocket. I have a feeling that I won't be keeping this phone for very long. The parish dates from 1908, and this church dates from 1997. 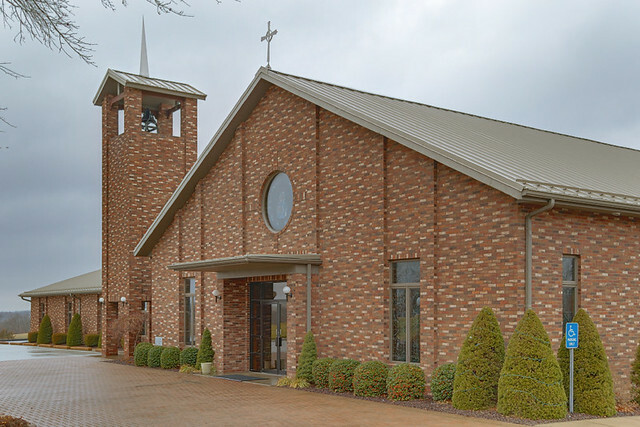 This parish consolidates the now-closed Nativity of the Blessed Virgin Mary parish in Belgique, Our Lady of the Rosary parish in Claryville, and Saint John the Evangelist mission in Lithium. Like many other churches in that part of the Archdiocese, it is staffed by a priest of the Congregation of the Mission. Sereno is an unincorporated hamlet located in rural Bois Brule township, Perry County, Missouri, and is about 84 highway miles southeast of downtown Saint Louis. Photo taken on December 31st, 2010. The church closed in 2005 and the convent is now an art studio; the chapel is a gallery. There was an exhibition going on at the time, and the chapel was crowded, and so I was only able to get a close up of the altar itself. 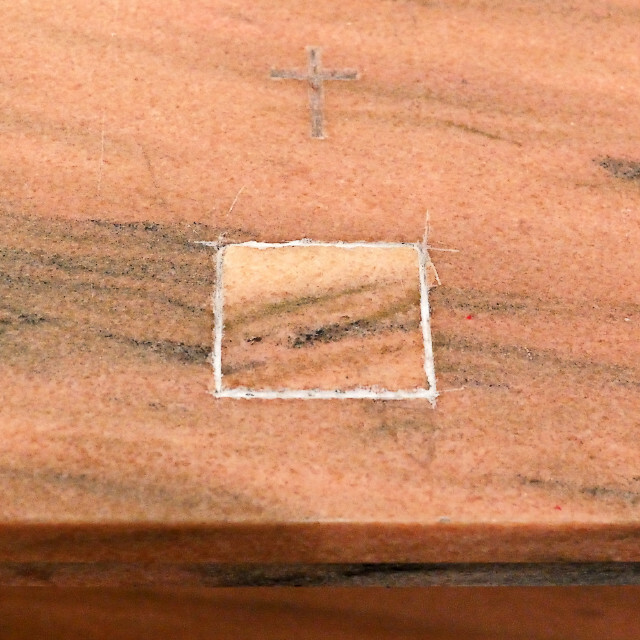 Do you notice the markings on the stone before the altar? 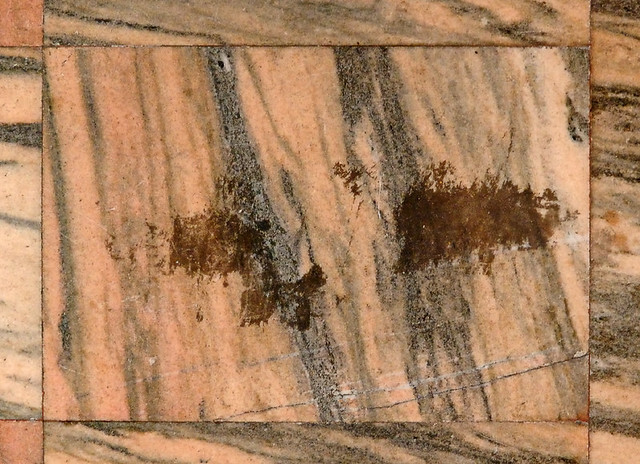 That appears to be precisely where a priest would genuflect after consecration; the left marking would be from his shoe, and the larger marking on the right would be from his knee. Traces of piety remain. 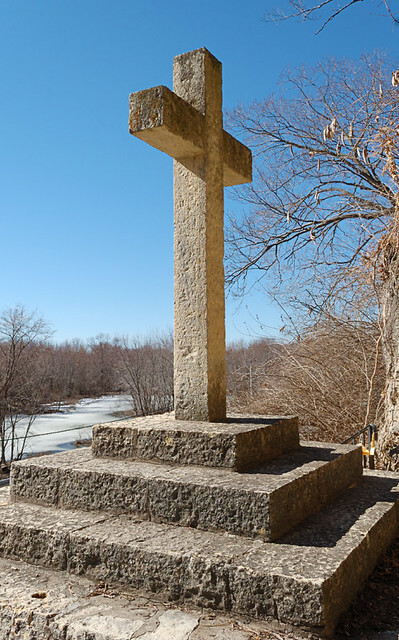 Consecration took place on this spot; we see one of the five crosses on the altar mensa, and the capsule where the altar relics were kept. Painting of Saint Agatha, virgin and martyr, at Saint Agatha's Church, in Saint Louis, Missouri. 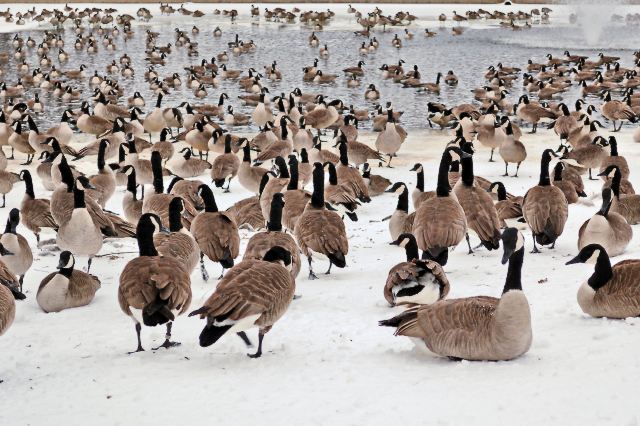 Photo taken March 5, 2010. Blessed Agatha standing in prison with outstretched hands prayed unto the Lord: O Lord Jesus Christ, good Master, I give Thee thanks Who hast enabled me to overcome the tortures of the executioners; bid me, O Lord, come happily to Thine unfading glory. Hungry waterfowl at Calvary Cemetery, in Saint Louis. SAINT LOUIS WILL NOT host the 2012 Democratic National Convention; instead it will be held in Charlotte, North Carolina. It will be the first time that Charlotte will host such a national party convention. Click here for the news story. In the early days of the Republic, candidates for the office of President were chosen by congressional party caucuses. As the nation expanded westward — seven western states entered the Union in the first third of the 19th century — remote geography led to severe differences of opinions between the voters and the politicians who resided in Washington D.C. The solution was to bring together larger numbers of party members in one place in a national party convention. The major parties held national presidential nominating conventions in nearly every election cycle since 1832. The most popular city for these conventions is Chicago, Illinois. 1876, Democrats, nominating Samuel J. Tilden. First national party convention held west of the Mississippi. Platform positions included: complete acceptance of the permanent Union of the United States and the Constitution; separation of Church and State, particularly in public schools; opposition to sumptuary laws, carpetbagging, centralization, patronage, and debased currency; lower taxes and tariffs, land for settlers; and opposition to Asian and encouragement of European immigration. Held at the old Merchants Exchange Building (destroyed in 1958 and now the location of the Adam's Mark Hotel). Festivities included fireworks launched from the Old Courthouse. 1888, Democrats, nominating Grover Cleveland. The incumbent Cleveland was nominated unanimously. Platform positions included lower taxes, giving land to homesteaders, better veteran benefits, and opposition to cheap foreign labor and manufactured goods. Held at the St. Louis Exposition and Music Hall. This was one of the earliest buildings in the country to have electric lighting, and was the home of the symphonic orchestra. Located near Olive and 13th Streets, it is now the site of the Central Branch of the Saint Louis Public Library. 1896, Republicans, nominating William McKinley. The party platform supported the gold standard, a canal across Central America, the Cuban revolution, annexation of Hawaii, and women's rights. Originally to be held at the St. Louis Exposition and Music Hall, that venue needed work which could not be completed in time. Taking place soon after the Great Cyclone of '96, a temporary structure was built on the lawn south of City Hall. 1896, People's Party, nominating the Democrat's candidate, William Jennings Bryan. This short-lived but influential populist party supported poor famers in the South and Great Plains, and was opposed to bankers, large landowners, and the railroads. The party was simultaneously one of liberal progressivism and traditionalist conservatism, and got support from northern Democrats and southern Republicans. This convention was contentious and marked the waning of the party, which was crushed within a few years by violent disenfranchisement throughout the South. The convention was held in the same hall used by the Republicans a month earlier. 1904, Democrats, nominating Alton B. Parker. Held at the Coliseum of the St. Louis Exposition and Music Hall; the convention took place during the 1904 Olympics and World's Fair held in Saint Louis. This convention was called "one of the most exciting and sensational in the history of the Democratic Party." The platform called for lower taxes and tariffs, less government corruption, an end to monopolies and imperialism. It was in favor of the 8 hour work day, Panama Canal, direct election of Senators, and was against polygamy. 1916, Democrats, nominating Woodrow Wilson. The platform included opposition to tariffs and monopolies; and was for banking reform, easy credit, trade unions, expanding post office delivery, encouraging patriotism and building up of the Navy, avoidance of war, opposition to the new government in Mexico, and simultaneously for the conservation and exploitation of natural resources. The convention was held at the Saint Louis Coliseum, built in 1908 as the largest public building in the United States. It was located at the southwest corner of Washington Avenue and Jefferson Boulevard, and was torn down in 1953. 1999, U.S. Taxpayers', American Independent, or Constitution Party, nominating Howard Phillips. The party platform is explicitly Christian, and calls for a limited constitutional government, elimination of income taxes and increased tariffs and excise taxes; the party also wants to put restrictions on immigration. The convention was held at the Regal Riverfront Hotel, built in 1974 and originally known as Stouffer's Riverfront Towers, and is now called the Millennium Hotel. 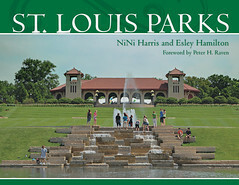 It is located on Memorial Drive, near the Old Cathedral and Gateway Arch. 2007, Socialist Party USA, nominating Brian Moore. Opposed to both capitalism and authoritarian communism, the party wants public ownership and workers' control of corporations, and is variously open to nonviolent revolution, pacifism, and armed struggle; it is opposed to foreign wars and to the support of Israel. The convention was held at the Holiday Inn Select Hotel across the street from the Convention Center. At one time, these national party conventions were important. However, this changed after the 1968 Democratic Party convention in Chicago. Vice President Hubert Humphrey had arranged for the support of enough delegates to win the nomination; supporters of Eugene McCarthy found they had no say, which led to widely-televised riots. Wanting to avoid this controversy in the future, most states turned to primary elections to determine delegates to the national conventions, and these delegates must vote for their candidate and no one else. There is no uncertainty when the convention is held: the winner is already known. National party conventions are now little more than celebrations. At Saint Bridget of Kildare school, in Pacific, Missouri. Photo taken 2009. 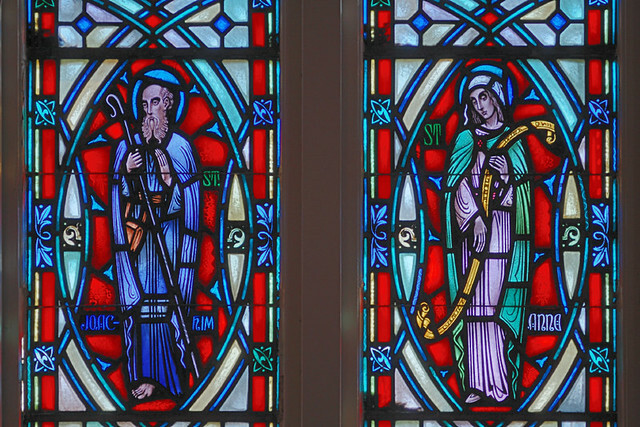 Saint Bridget, patroness of Ireland, c. 451–525.